by Robert A. Moore Jr.
fter midnight on Christmas Eve, the ringing doorbell announced the arrival of a visitor. Normally we would have been leery of letting anyone in so late. However, the big German house, home of the Augsburg Servicemen’s Center and about a mile from the nearest American army post, had been a busy place for several days. Soldiers, working half-day holiday schedules, had spent every spare moment transforming the old house into a home-away-from-home for Christmas. Even at this late hour, several of the single soldiers were still up making cookies, listening to music, and telling each other stories of Christmas from their childhood. They seemed oblivious to the clanging doorbell, so I moved to respond. I opened the door to find a large American soldier with cheeks red from the cold and eyes swollen from alcohol and tears. His gaze met my questioning stare, and he quickly explained himself. I invited him in from the cold and asked one of the guys to get him a warm drink and something to eat. The guys swarmed him, seemingly as eager to add him to their Christmas celebration as he was to find a home. Once seated, we asked his name and how he had come to our door this late on Christmas Eve. His answer poured out. My eyes filled with tears as he recounted an all-too-familiar story. He had been raised in church but, disconnected from fellowship and family support, he had strayed further and further away. His loneliness had led him to go with a group of other soldiers to downtown Augsburg to visit bars, a brothel, and the festive aisles of the Christmas market. It was there he realized he had lost all of his fellow revelers from his post. It was there, too, that he had a flood of revelation: his burden of loneliness was compounded with a sense of guilt and failure. Having compromised his values, Andy felt more alone than ever before. In the midst of a cacophony of Christmas lights and revelry, he felt guilt-ridden and hopeless. He wanted to cry out in repentance, but all he could do was groan. He imagined his mom and dad praying for him back in Walhalla, and he felt even more ashamed. He told us he must have sobbed tears of repentance for some moments because some of the nearby revelers began to stare at him and wondered if he was losing control. In his mind, he told us, he was aware God was forgiving him but wondered how he could go on. How could he know that he wouldn’t just be right back out there again before the holiday was over? “God knew my thoughts and answered me very clearly. 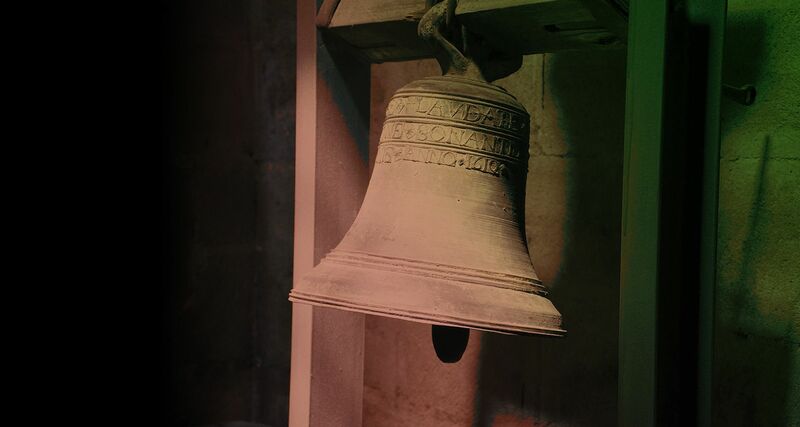 I heard the Holy Spirit say, ‘Come home.’ At first I wanted to argue because I thought it meant I should go AWOL and catch a flight back to the U.S. Then I got my answer—the bells in the downtown churches all started to chime, announcing it was midnight. The revelers began to cheer—and I did too, but for a different reason. I knew the Lord was telling me to come home to Him and to His house! The bells in the downtown churches all started to chime, announcing it was midnight. I knew the Lord was telling me to come home to Him. It didn’t take long for Andy to embed in our fellowship and outreach. He became an effective witness for Jesus Christ. He was quick to tell others how he had miraculously found his way home on the night before Christmas. He would tell you, in his own words, how the Holy Spirit had declared his need for Jesus, revealed the next steps to walk with Him, and then supernaturally helped him connect with a faith-family that supported him on his journey. The Holy Spirit has been fulfilling this pattern of ministry for thousands of years. Consider three examples from Luke 1 and 2. When Mary was told by the angel Gabriel that she would bear a child─not just any child, but the Messiah─“she was troubled at his saying” (1:29 NKJV). How could this be? The angel revealed how this would happen: “The Holy Spirit will come upon you, and the power of the Highest will overshadow you. . . . With God nothing will be impossible” (vv. 35, 37 NKJV). Mary responded, “Behold the maidservant of the Lord! Let it be to me according to your word” (v. 38 NKJV). Mary then went to visit her relative Elizabeth, who was well into her own miraculous pregnancy. Upon Mary’s arrival, Elizabeth’s unborn son, John the Baptist, leaped for joy in her womb (v. 44). Elizabeth was suddenly filled with the Holy Spirit, who revealed to her that Mary was carrying the Messiah. Elizabeth declared, “Blessed are you among women, and blessed is the child you will bear” (v. 42 NIV). Elizabeth had been enabled by God to declare the coming of Christ even before He was born. After Jesus’ birth, Mary and Joseph took their 3-day-old son into the Temple to dedicate Him to God. There, the Holy Spirit revealed the Child’s identity to a devout priest named Simeon. The old man took Jesus in His arms and declared, “For my eyes have seen Your salvation, which You have prepared before the face of all peoples” (2:30-31). At that moment, the Holy Spirit anointed 84-year-old Anna to prophesy about the newborn Savior. More than 2,000 years later, the Holy Spirit spoke to a young soldier in Augsburg, Germany, about the Savior, telling him to come home. When Andy Rafferty shared his story that night, strong young men wept openly. I’ve teared up again as I recounted this story for you. This has been a pattern I’ve witnessed thousands of times since then. The Holy Spirit uses the occasion of someone’s pain to call them to Christ. When they respond in faith, He reveals the way home. He seems to especially delight in connecting and reconnecting people during the holy Christmas season. Robert A. Moore Jr., DSL, serves as director of Church of God Ministry to the Military and lives in Cleveland, Tennessee.